David S. Lafferty has over twenty-five years of broad based experience practicing law. He has experience includes commercial and Chancery litigation, land use, probate, real estate and commercial transactions. He has counselled individuals, small and mid-sized business entities and has served as local counsel for nationally publicly traded companies. 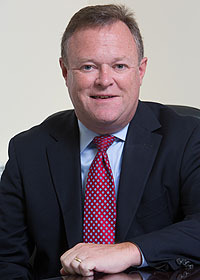 Mr. Lafferty graduated Villanova University (1988) with a degree in Finance, and Pace University School of Law (1991) where he was an editor of the Pace Environmental Law Review. Following law school, he served as a Judicial Clerk for the Hon. James T. Murphy, J.S.C. of the Superior Court of New Jersey in Bergen County. Mr. Lafferty began his private practice handling insurance defense and coverage matters at a small firm in Hackensack, gaining valuable trial experience. Previously, he was a partner in another mid-sized firm in Bergen County prior to joining Huntington Bailey, LLP. Mr. Lafferty served 15 years collectively as a Municipal Court Judge for three municipalities in Bergen County, following his appointment as Municipal Prosecutor and Public Defender in several towns. He served as Zoning Board Attorney for five years. He was appointed by the Supreme Court of New Jersey to the District IIA Attorney Ethics Committee, serving as Chair in 2008. He has been received numerous judicial appointments throughout his career including Condemnation Commission and Guardianship Attorney.